But all the plans, advice and information in the world won't make someone change. They have to want to do it, they have to believe that they CAN do it and they have to give themselves the tools to actually change. 'Choosing You!' came about as a result of helping thousands of people acheive real and lasting change. 'Choosing You!' outlines techniques for mindfulness, awareness, goal setting and dream achievement that I have used to succeed at an elite level in several sports and to beat the effects of serious illness and that I have honed as a success and health coach to elite level athletes, the chronically ill and as a mentor to fellow health practitioners. 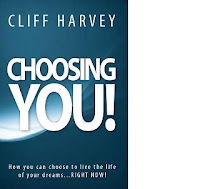 How you can choose to live the life of your dreams...RIGHT NOW! Chapter 2 - There are NO Victims Here! Feel free to contact me directly: cliff@fitnet.co.nz if you have any questions about 'Choosing You!' or any of my other health and lifestyle coaching services.